Are you ready to learn about monitoring patient on the ventilator? I sure hope so because that’s what this study guide is all about. As a Respiratory Therapist, it goes without saying that you will required to treat patients receiving mechanical ventilation. You will establish and secure an airway and then initiate the proper ventilator settings. But oftentimes we seen to overlook the importance of actually monitoring the patient once they are setup on the ventilator. This is something you is crucially important for you to understand as well, and it’s what we are going to cover in the practice questions below. Are you ready to get started? 1. 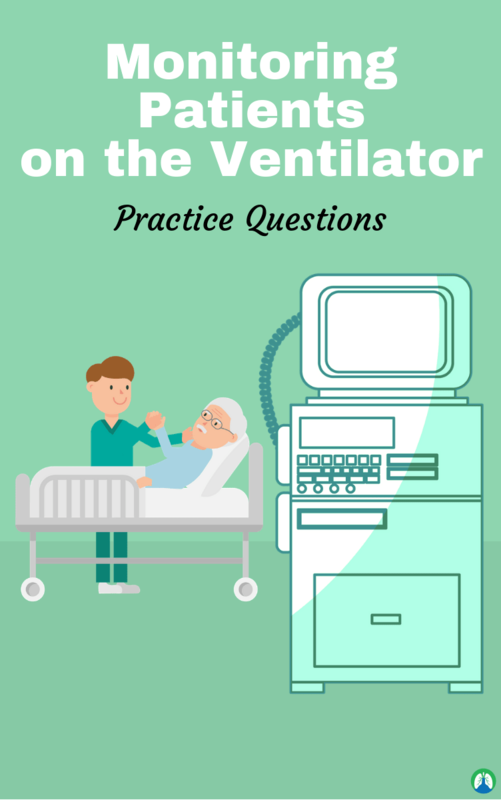 What should the Respiratory Therapist do first before a vent check while monitoring a patient on the ventilator? Establish a baseline for the initial assessment. 2. What do you look for before a visual assessment? Look at the patient’s chest x-ray, labs, medication, history, previous vent checks, make sure there is an ambu bag in the room, and if the settings have changed from your last vent check, see if the patient can tolerate those settings. 3. When should you do a vent check? Timed checks, when there are changes – document the change and do another vent check, when there are problems or alarms after you obtain an ABG, and to monitor their hemodynamic values. 4. Why do we do a really thorough vent check first thing in the morning? 5. What should you think of when looking at the mean airway pressure? Always think: oxygenation. You and increase the MAP to improve oxygenation. 6. How can you increase the MAP? By increasing the PEEP level. 7. What should the apnea alarm be set at? 8. What should the high/low respiratory rate be set at? It should be set 10 above/below the average but no more than 35 and no less than 8. 9. What should the high/low tidal volume be set at? It should be set at 100 above/below the average tidal volume. 10. What should the high/low minute ventilation be set at? It should be set a 2 L above/below the average minute ventilation. 11. What should the high pressure be set at? It should be set as 10 above the PIP, and no more than 35. 12. What will happen if there is a loss of compressed air? The patient will get 100% oxygen. 13. What type of trigger is best for reducing work of breathing? 14. Monitoring the functions of the ventilator system should be performed how frequently? As frequently as the clinical situation dictates. 15. In general, most patient/ventilator systems should be evaluated how often? Every 2, 4, and 8 hours in acute care centers. 16. Who may require more frequent ventilator checks? 17. Who may require evaluation only every 4 hours? 18. What are the measurements that are taken with the patient spontaneously breathing? Tidal volume, Respiratory rate, Minute ventilation, Vital capacity, MIP, and MEP. 19. What are measurements that are taken during ventilatory support? Exhaled tidal volume, Respiratory rate, Inspiratory flow, Alveolar minute ventilation, Deadspace ventilation, and Minute Ventilation. 20. What is the actual volume delivered to the patient that will be lower than the set tidal volume because a portion of the volume (the compressible gas volume remains in the expanded ventilator circuit? 21. How is exhaled tidal volume calculated? 22. How is minute ventilation calculated? 23. How is alveolar minute ventilation calculated? 24. When calculating minute ventilation, what should be used as the Vd? The actual weight of the patient (1 mL per lb of ideal body weight). 25. What is the best way to increase alveolar ventilation? By increasing the tidal volume. 26. What is known as the amount of common circuit tubing between the patient and the wye adapter in the ventilator circuit? 27. What are the two types of compliance that can be monitored in order to monitor airway pressures to detect changes in lung compliance and airway resistance? 28. What is the formula for finding dynamic compliance? 29. What is the formula for finding static compliance? 30. What the normal value for static lung compliance? 31. When and how is a plateau pressure measured? At the end of inhalation with a breath-hold maneuver. 32. What does increasing airway pressures indicate? The lung is becoming more difficult to ventilate. 33. What are two reasons that airway pressure increases during mechanical ventilation? (1) Increasing airway resistance and (2) Decreasing lung compliance. 34. What is the value for normal airway resistance? 35. What is known as the frictional force that must be overcome during breathing? 36. For an intubated patient, what may the airway resistance value reach? 37. With increasing airway resistance, what does the PIP do? 38. With increasing airway resistance, what does the Plateau pressure do? 39. With increasing airway resistance, how can it be calculated? 40. What are 2 common causes of increased airway resistance and what are their treatments? (1) Secretions in the airway, which is treated by suctioning; and (2) Bronchospasm, which is treated with a bronchodilator. 41. With decreasing lung compliance what will the PIP do? 42. With decreasing lung compliance what will the plateau pressure do? 43. What are the common causes of decreasing lung compliance and what are their treatments? Atelectasis, Pulmonary Edema, ARDS, and Pneumonia. To treat, you must increase the PEEP and treat the underlying causes. 44. What is the average pressure transmitted to the airway from the beginning of one breath to the beginning of the next? 45. What are the controls that directly affect Paw? PIP, Respiratory Rate, Inspiratory time, PEEO, Peak Flow, Tidal volume, and Inflation hold. 46. What is the most influential control that directly affects Paw? 47. What is the typical Paw value for a patient with normal compliance and resistance? 48. What is the typical Paw value for a patient with an obstructive disease? 49. What is the typical Paw value for a patient with ARDS? 50. What formula may be used to calculate work of breathing? 51. What two pieces of equipment can be used to measure work of breathing? A Manometer or a Spirometer. 52. What is the normal value for work of breathing? 53. Can the work of breathing be easily measured during spontaneous breathing? 54. What does Paw primarily effect? 55. Can the work of breathing be measured during mechanical ventilation? Yes, yes it can be measured during mechanical ventilation. 56. Does the work of breathing increase or decrease when a patient has a pulmonary disease? 57. Increased work of breathing can be detected clinically by noting what three things? Accessory muscle use, Tachypnea, and Retractions. 58. When inspiratory muscles tire, the tidal volume decreases. What happens to the respiratory rate? 59. What are the early signs of hypoxia? Tachycardia (1st response), Dyspnea, Shortness of breath, Restlessness, Tachypnea, and Diaphoresis. 60. If left uncorrected, hypoxia in late stages will result in what? Bradycardia, Lethargy, Fatigue, and Cyanosis. A bluish discoloration of nail beds and mucus membranes caused by an excess in desaturated hemoglobin in the blood. 62. Mental alertness and pupillary response are signals of what? They are signals that cerebral perfusion is adequate. The normal Intracranial Pressure (ICP) is 7 – 15 torr (average, about 10 torr). 63. Breath sounds that were diminished in an area where they were previously normal may indicate what? Right mainstem intubation, Plugged ET tube, Mucus plugging, or a Pneumothorax. 64. What is a right mainstem bronchus intubation? It occurs when the endotracheal tube has been pushed in too far causing gas flow to the left lung to be absent. Breathe sounds will be absent on the left side. 65. What is a Pneumothorax? Air in the pleural space will cause an increased distance that sound must travel through, therefore, the sounds will be diminished or absent. 66. What is the purpose of a ventilator circuit change? To limit the occurrence of nosocomial infection, to maintain circuit integrity, and to provide a clean circuit appearance. 67. What are the risks of ventilator circuit change? Predisposing patient to injury during change, hypo- or hyperoxia or hyper or hypocapnia, airway obstruction or displacement, transmission of pathogen to patient of staff, patient may not be safely maintained during disconnection, malfunctioning ventilator or circuit, failure to assure proper function after reconnecting, disconnection of ventilator circuit can cause contaminated ventilator condensation to spill in patients airway (risk of infection). 68. What can changing ventilator circuits too frequently cause? 69. What should the Respiratory Therapist do after changing the circuit to check the patient? Evaluate patient to confirm that the ventilator has been reinstituted and the parameters are stable. 70. How often should you change ventilator circuits? Only as needed, when it is damaged or visibly soiled. Breaking the circuit increases the risk of VAP. 71. What is the first immediate response to hypoxemia/tissue hypoxia? An increase in heart rate that occurs because the patient is compensating. 72. What is the late response to hypoxia? Bradycardia, because the patient is decompensating. 73. Cyanosis may be seen with what? It may be seen with hypoxemia or a decreased cardiac output. Additionally, excessive pallor or paleness especially when accompanied by cold moist skin may indicate cardiovascular collapse or shock. The minimum urinary output in the ICU is approximately 30 mL/hour. If the urinary output is less than 30 mL/hour, then cardiac output and kidney perfusion may be compromised by positive pressure ventilation. 75. What is the Capillary refill? Following a 5 second compression of the nail beds, the natural nail color should return within 3 seconds if peripheral perfusion is adequate. 76. What are the characteristics of peripheral pulses? Weak and “thready”, bounding, uneven (checking bilaterally). A good rule of thumb is that if the palpated pulse is not normal, then the cardiac rhythm is not normal and the patient may need ECG monitoring. 77. If our patient has an extreme form of atelectatic shunt such as with ARDS, how can we continue to promote oxygenation? 78. Positive End Expiratory Pressure can help to reverse atelectatic changes by? By maintaining a fixed positive pressure within the airway and alveoli and the end of exhalation. When used with assisted ventilation, the term PEEP is used; with spontaneous breathing, the term CPAP is used. 79. What are the advantages of PEEP? It opens ‘closed alveolar units’ which increases FRC, it improves compliance and oxygenation, it may lower PIP and PLT by having more alveoli accepting volume, and it improves collateral ventilation and mobilization of secretions. 80. What are the disadvantages of PEEP? Barotrauma, decreased cardiac output, hypotension, decreased renal perfusion, decreased urinary output, and an increased intracranial pressure. 81. What is important to monitor once the mechanically ventilated patient has 10.0 cm H2O of PEEP? It is critically important to monitor their hemodynamics, such as an arterial blood pressure, as well as noninvasive blood pressure or invasive blood pressure. You should also monitor other hemodynamic values such as Qt, PA pressure, and PCWP. 82. You should begin treating the patient’s Auto-PEEP once the level of Auto-PEEP is what? 10.0 cm H2O or higher. 83. Increased levels of FIO2 greater than 0.5 to 0.6 can lead to what? Oxygen toxicity of the lungs. 84. Too much PEEP may cause what? 85. You can increase PEEP in increments of what? Increase PEEP in increments of 2 until at it reached 10.0 cm H2O, then stop. 86. The Respiratory Therapist will increase PEEP incrementally until what occurs? 87. Increased oxygenation will be attained by increasing what? By increasing the FiO2 above 50%. 88. PEEP increases the FRC by raising what? By raising the patient’s baseline. If you raise the patient’s baseline (the volume remaining in the lungs at the end of a normal tidal volume) there is a concomitant increase in the functional residual capacity. 89. If a patient has atelectasis, then we can suspect that FRC is what? That it is decreased. By adding PEEP and recruiting alveoli, FRC is then restored. 90. Auto-PEEP is an important and sometimes serious level of airtrapping exhibited by what patient? By patient who are not allowed adequate exhalation time. Auto-PEEP may be exhibited in normal lungs but is particular to over-compliant lungs in the COPD. 91. Why is Auto-PEEP often seen in the over-compliant lungs of COPD patients? The COPD lung has lost elasticity (elastic recoil) and requires a longer time to deflate to baseline. 92. COPD lungs contain obstructed airways due to what? Due to secretion retention and bronchospasm and therefore the expiratory flow is decreased. 93. COPD lungs have lost airway caliber and tend to collapse prematurely due to what? Due to increased intrathoracic pressures surrounding the airway during exhalation. 94. What patients should be evaluated for Auto-PEEP risk factors? Patients with increased airway resistance, narrowing, and collapse; Patients with overly compliant lungs (i.e. Emphysema); and Patients with long inspiratory time, short expiratory time, high frequency, and large tidal volumes. 95. How may Auto-PEEP be eliminated? Increasing the IFR, Increasing the set PEEP, Decreasing mechanical tidal volume, Decreasing mechanical frequency, and Changing the IFR waveform. 96. How do you correct Auto-PEEP by using mechanical PEEP? You can add mechanical peep that is equal to the amount of Auto PEEP in order to correct the issue. And that wraps up our study guide on monitoring patients on the ventilator. I hope you can use this information to enhance your confidence on how to properly monitor patients that are receiving mechanical ventilation. I definitely recommend that you go through these practice questions multiple times until the information sticks, because you will most likely see it again on your exams in Respiratory Therapy school and on the board exams as well. Thank for you reading and as always, breathe easy my friend.